In the Iraqi Kurdish region a law against FGM is in place and all TV and radio-channels are airing information about FGM. This is part of a large-scale campaign against Female Genital Mutilation which is run by WADI and Unicef. Politicians, doctors, clerics, policemen and the media are supporting the battle against this harmful traditional practice. In this video-clip a doctor is explaining the harms of FGM to a mother seeking advice. In this video-clip a remote village in the Kurdish mountains is shown. A man dressed in traditional Kurdish gown listens to a radio program informing people about the harms of FGM and the law which prohibts it. The woman a girl at her hand hears the program and changes her mind about mutilating the girl. The two main actors, the man and the woman, are champions of the battle against FGM: Sarhad Ajeb is the Anjuman (village head) of Toutkhel, one of the FGM-Free villages in Iraq. He and his wife Nasreen are at the fore front of the campaign convincing neighboring villagers, presenting the cause in TV-shows and talking to press and politicians. In this video-clip one of WADI and Unicef’s mobile teams arrives at a remote village. These mobile teams visit the Kurdish villages regularly educating about FGM and the law against domestic violence, but also discussing daily issues and needs of the population trying to find solutions. In the Iraqi Kurdish region all relevant actors are embracing a large-scale campaign against Female Genital Mutilation which is run by WADI and Unicef. Politicians, doctors, clerics, policemen and the media are supporting the battle against this harmful traditional practice. Religious beliefs play an important role in the battle against female genital mutilation (FGM). Clerics are part of the large-scale campaign against FGM in Iraqi Kurdistan. In this video-clip an Imam explains why FGM is not in accordance with Islam. Heartbreaking video by the Iranian Kurdish singer Chiman Rahmani. Female Genital Mutilation is still practiced on girls in Iran today. It is prevalent in the Southern province of Hormozkhan and in the Western provinces Kurdistan, Kermansheh and some areas of Western Azherbaidshan. Chiman Rahmani is herself from Kermansheh. 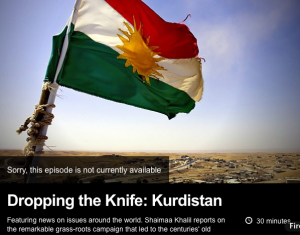 The BBC-Documentary: “Dopping the Knife – The Fight against Female Genital Mutilation in Kurdistan” tells the story of the Stop FGM campaign in Iraqi Kurdistan. “…and then they put ash there”, tell the women in this documentary on female genital mutilation in Kurdish northern Iraq. The movie evolved from the work of the relief organization WADI, which combats female genital mutilation in northern Iraq. To raise awareness in European publics to the problem of FGM in Iraqi-Kurdistan, filmmaker Nabaz Ahmad created a documentary, in which Kurdish women vividly describe their experiences. The movie approaches the subject respectfully and carefully, with expressive pictures of a simple life in remote landscape. The sensitive and carefully observing camera work enables to look at the suffering, which emerges without sensational and bloody scenes. The movie was shown in various film festivals. Nabaz Ahmad works since 1998 as a screenplay writer, assistant director and director for Kurdish film productions and TV stations. In 2001 he made his first short movie. “Handful of Ash” is his first documentary. The movie can be purchased on DVD (for EUR 25) for private use. For public events and presentations, the movie is available in different cinema formats. We are happy to offer speakers and information materials. Please contact us for prices and conditions. Order here the DVD “Handful of Ash” (EUR 25), screening is permitted for private purposes.